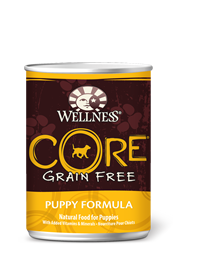 Grain-free, high-protein CORE Puppy food has the calories and Docosahexaenoic Acid (DHA) puppies need for development. It’s made from chicken, turkey, salmon oil and fruits and vegetables. 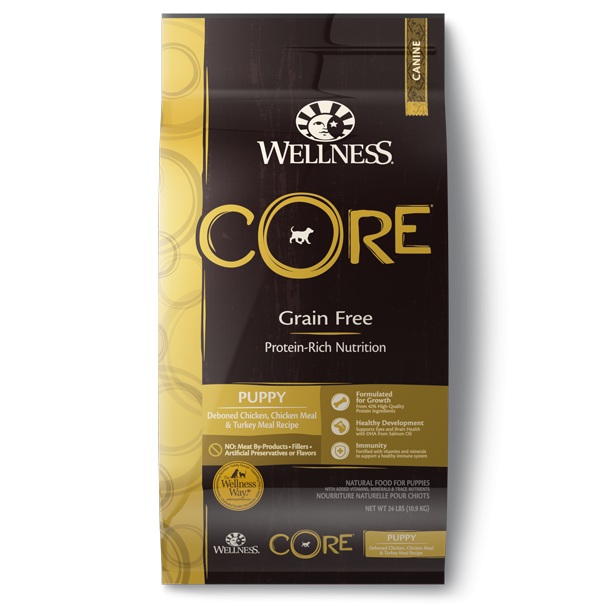 Wellness® CORE® Puppy Formula Dog Food is formulated to meet the nutritional levels established by the AAFCO Dog Food Nutrient Profiles for growth and gestation/lactation. It is important to slowly transition your puppy from his/her current diet as it takes a few days for the body to adapt to new nutrient levels. To transition, gradually mix in the new food over a 5-7 day period, increasing the amount of Wellness CORE each day, so that you are feeding 100% Wellness® CORE® by day 7. As puppies grow up they need to learn when, where and how to eat. Depending on age, puppies need to be fed at the same time and in the same place 2-4 times per day. Food should be removed after 20 minutes, if not eaten. 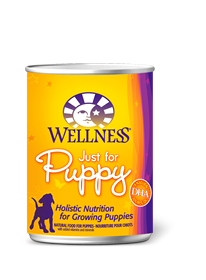 In the beginning, puppy’s food can be moistened with a little warm water. Looking at the chart to the below, divide the total grams per day by the total number of times you feed your puppy per day to determine the portion size for each meal. Give your puppy access to clean, cool fresh water at all times and feed Wellness® CORE® wet food in combination whenever possible, to increase the level of water in your puppy’s diet. Nutrition is the foundation of wellbeing, but be sure to give your puppy plenty of love, exercise and see your veterinarian regularly. Combination Feeding: If feeding with wet food, reduce dry amount by 37 grams for every 170g of wet food. Calorie Content: This food contains 3,792 kcal per kilogram or 417 kcal per cup ME (metabolizable energy) on an as fed basis (calculated).